Emirates today reinforces its commitment to Russia by announcing the upgrade of the aircraft servicing the St Petersburg route to a Boeing 777-300ER, increasing capacity and offering an enhanced onboard experience. Six weekly EK175/176 flights, from Dubai to St Petersburg, will be operated with an Emirates Boeing 777-300ER from 25 October 2015, instead of an Airbus 330-200. The up-gauge will be applied to a seventh flight per week on the 1 December 2015. By replacing the A330-200 with the Boeing 777-300ER, Emirates will be adding a capacity increase of 50% to the route, which launched in November 2011. 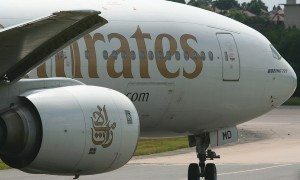 The new aircraft will also introduce the Emirates First Class Suite, a first for the route, plus 42 lie-flat Business Class seats and 310 spacious Economy Class seats. “Since 2011, when Emirates launched flights to and from St Petersburg, we have carried over 500,000 passengers on the route. Counting these figures alongside our double-daily flights to Moscow, takes the total to over 3.6million passengers travelling on Emirates to and from Russia in the 12 years of operation, making it an important market not only for Emirates, but for Dubai as a destination,” said Thierry Aucoc, Emirates’ Senior Vice President, Commercial Operations – Europe and Russian Federation. 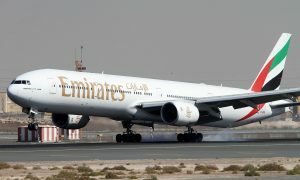 Emirates’ flight EK175 departs Dubai International Airport at 09:20 and arrives in St Petersburg at 14:35. The outbound flight EK176 departs from St Petersburg at 16:35 and arrives in Dubai at 23:45.